St. Martin's Press, 9781250085207, 288pp. 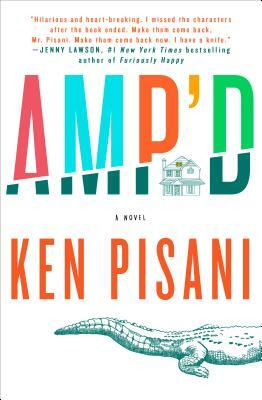 Ken Pisani's sharp and hilarious debut novel AMP'D tells the story of a man who returns to his boyhood home after his arm is amputated, forcing the most awkward of family reunions as he struggles to feel whole again and falls in love with a voice on the radio. Aaron is not a man on a hero's journey. In the question of fight or flight, he'll choose flight every time. So when a car accident leaves him suddenly asymmetrical, his left arm amputated, looking on the bright side just isn't something he's equipped to do. Forced to return to his boyhood home to recuperate, Aaron is confronted with an aging father (a former Olympic biathlete turned hoarder), a mother who's chosen to live in a yurt with a fireman twelve years her junior, and a well-meaning sister whose insufferable husband proves love isn't just blind, but also painfully stupid. As Aaron tries to make the world around him disappear in a haze of Vicodin and medical marijuana, the only true joy in his life comes from daily ninety-second radio spots of fun science facts: the speed of falling raindrops, batteries made out of starfish, and sexual responses triggered by ringtones - all told in the lush, disembodied voice of commentator Sunny Lee, with whom he falls helplessly, ridiculously, in love. Aaron's obsession with Sunny only hastens his downward spiral, like pouring accelerant on a fire. Pressured to do something - anything - to move his life forward, he takes the only job he can get. As a "fish counter" at the nearby dam, where he concludes that an act of violent sacrifice to liberate the river might be his best, final option. KEN PISANI is the Los Angeles Times bestselling author of AMP'D and a finalist for the 2017 Thurber Prize for American Humor. He's also a television writer and producer, screenwriter, playwright, comic book author, and former cartoonist. (Ken needs to learn how to focus.) He lives in Los Angeles with his beautiful wife Amanda, and is allergic to dogs.